Let's give thanks for manners, music and movement! Give thanks and get festive this Thanksgiving with our “What Do You Say? Please and Thank You!” album and accompanying activity below. The nine contagiously catchy tracks will teach your little ones perfect manners and get the whole family up and moving this holiday season. Play Track 7 and follow along with the song’s commands. When you hear “shoobie doo,” show off your family’s unique charm by creating your very own family move. Not only is the “Please and Thank You Dance” fun for the whole family, it engages your child in many levels of learning. Kids get great practice with their manners and learn to be socially adept, becoming gracious members of society. The activity also promotes healthy physical development because dancing is exercise – perfect after all the holiday treats! 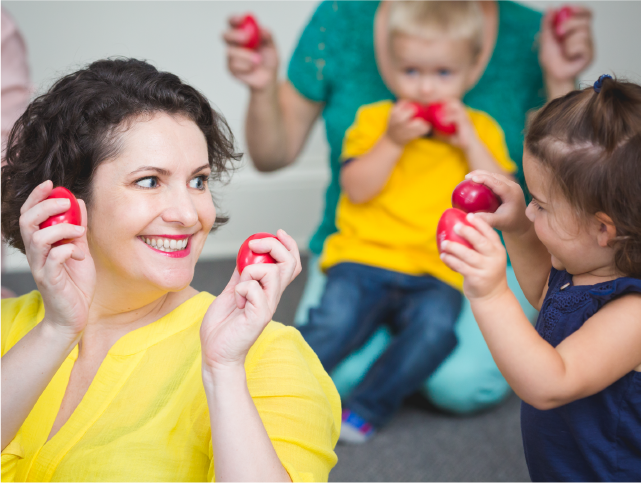 Most important, this dance will help develop your child’s early executive function and self-regulation skills that are critical for learning in school and for functioning as responsible members of adult society. These skills help children learn planning, teamwork, responsible decision-making and adaptability. Now let's get up and get moving! In every Kindermusik class, you’re welcomed into a playful and nurturing environment where your little one will have fun singing, moving, playing instruments, hearing stories–while developing social skills, problem-solving skills, pre-math skills and a foundation for reading.